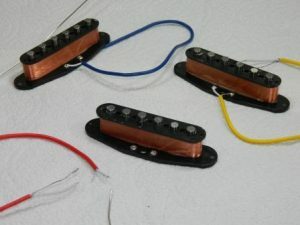 Building single coil pickups is surrounded in history, myth, and (understandably) great interest. A home DIY builder, a big player, or a smaller family enterprise like Ironstone, all need to go through a similar series of build stages. 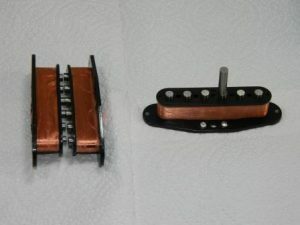 This Blog series focuses on Ironstone's 'Hybrid' single coil Stratocaster pickups. The name comes from their design being a mix / hybrid of traditional construction (Alnico V magnets with vintage pole stagger), and modern materials (shielded cable and resin bobbin rather than fibre flatwork). These blogs follow the production steps from beginning to end. So you can see what goes into the final product. Welcome to the workshop! 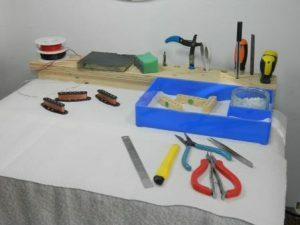 The Ironstone workshop has several workstations set out for different tasks. 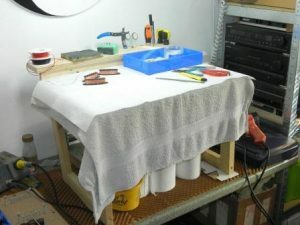 Building single coil pickups is just so much more efficient with everything to hand. The design began by Ironstone determining the specification of the pickups, explained in the 'About us' section of this website. The actual winding process is then sub-contracted to keep costs down. 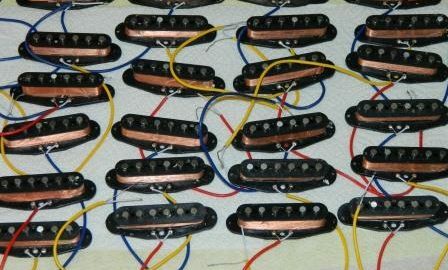 Whilst hand 'scatter-wound' pickups can be sonically excellent, they are time consuming and thus expensive to produce. So these pre-wound bobbins form the starting point for the Hybrid set. Basic checks all the way through the process are at the heart of Ironstone quality control. The pole pieces are supplied as a 'default' pattern used on some other Ironstone Strat styles. So, the first job is checking all of the pole piece orientations. That means checking the middle pickup is reverse magnetic polarity to the other two. 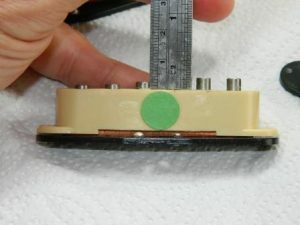 Then the individual poles are checked for correct mounting, i.e. all 6 in a pickup are the same way round. These checks are done simply by the law of 'opposites attract' with other magnets. All Ironstone pickups are built to an electrical specification with a +/- 5% tolerance on DC resistance. So an initial check determines coil continuity, and that it is within the required resistance range. 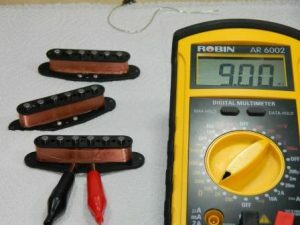 Here, a Hybrid Bridge pickup specified at 9.0K is measured, and this particular one is exactly on spec. An advantages of modern synthetic resin bobbins, is that the pole pieces sit in 'silos' through the bobbin. So different pole piece stagger patterns can be produced by moving the cylindrical pole pieces in those silos. Traditional flatwork construction is fixed once assembled. The logic and myth behind pole piece stagger is fully explored in the support page 'Staggered Pole Pieces' . The Hybrid's use a 'quasi vintage' pattern. That takes into account modern string types, yet provides significantly better string matching than flat pole designs. Using a simple jig, the pole pieces are first gently tapped further out / up from the bobbin . Even though the pole pieces are free to move in the bobbins, they still have a small contact area with the windings. So once all 6 poles in a pickup have been re-positioned, its time for another quick electrical continuity check. 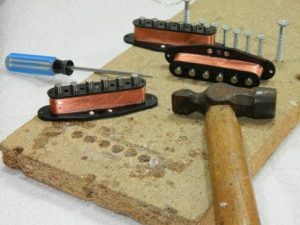 With care, very few problems occur, but its probably not a good thing for a DIYer to try with their favourite pickup. Resin bobbins are sometimes criticised for being a sonically inferior alternative to 'conventional' fibre flatwork construction. That is a debatable effect. A factor that is rarely mentioned though, is that a bigger influence on tone is the winding coils cross-section. Simply, a taller thinner coil section generates a brighter tone. A squatter wide coil gives a fatter tone with more mid-range. 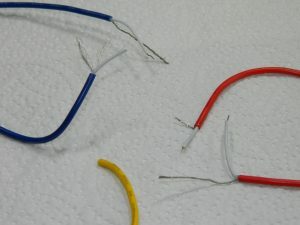 Any given length (resistance) of winding wire has a longer path round the bulkier inner part of a resin bobbin. That tends to give a thinner coil with greater tonal clarity and sweet treble. The Ironstone Hybrids are produced in batches of around 20 pickup sets (60 pieces). The reason for this is that the next step is wax potting, a full 20+ minute wax bath to seal the windings. That is an all day task with 20 sets! The Hybrid's have the greatest amount of manual input and skill of the Ironstone resin bobbin Stratocaster range. This is demonstrated in the second part of the blog. It will focus on the remaining processes, wax potting, (more) electrical checking, taping, finishing (and final checking!). 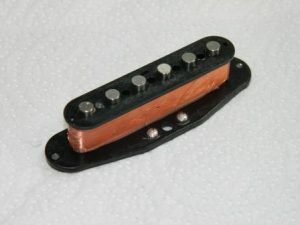 Check out the Ironstone 'Building single coil pickups part 2' blog, coming soon.